Learn and dance some favorite waltz mixers to exquisite live music by vintage dance band Transit of Earth. From classic Victorian and Edwardian waltz mixers to hauntingly beautiful modern creations, enjoy the pleasure of waltzing from one partner to another and learning some useful waltz variations! Neither partners nor dance experience are required; you’ll be changing partners frequently. Even if you’re not yet a waltzer, you’ll be waltzing with ease before the end of the workshop. This class is designed for adults and teens, but children under 12 are welcome if partnered by a responsible adult. Cathleen Myers is the Dance Mistress of the San Francisco Dickens Fair and the Artistic Director of PEERS (the Period Events & Entertainment Re-Creation Society), which produces full-scale historical costume balls almost every first Saturday (for more information about PEERS and its upcoming balls and dance classes, see website link below. A dancer since childhood, Cathleen has researched and taught historical dance in the Bay Area since 1987. With her husband James Eric Myers, she has dance-mastered at a wide variety of Bay Area period balls, charity balls, and science fiction/fantasy conventions and teaches a weekly vintage ballroom dance class on Sunday afternoons at the Alameda Elks Lodge. 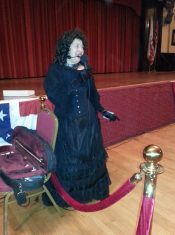 An experienced historical dance choreographer, she also performs occasionally with the Alameda Vintage Dancers and with her own group, the PEERS Flying CirCUS, a historical music, dance and theater performing ensemble, most notorious for their recurring Peerless Music Hall and Theater of the Vampires.